Nina Dobrev joined her co-star Vanessa Hudgens for the premiere of ‘Dog Days’ on Sunday (August 5) in Century City, California. Creative Director Pierpaolo Piccioli’s vision for this Valentino Pre-Fall 2018 dress was graphic bursts of pop-art. 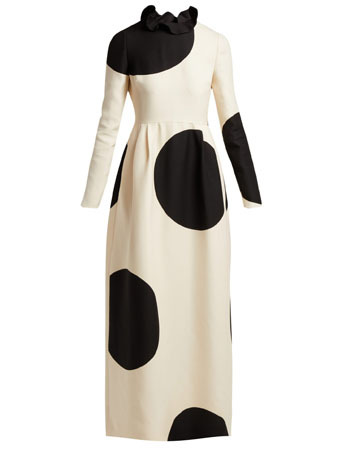 But if you were anything like me, your first thought when seeing this monochromatic dress was a cow or Dalmatians, which would fit in nicely with the theme of the movie. Either way this ankle-skimming piece featuring a dramatically rounded collar and gentle pleats at the hips was oozing with sophistication. Nina tends to go for cutesy looks, so I love how this felt more grown up.